It’s a truth universally acknowledged that everyone loves rats!! Yes, no, maybe!? 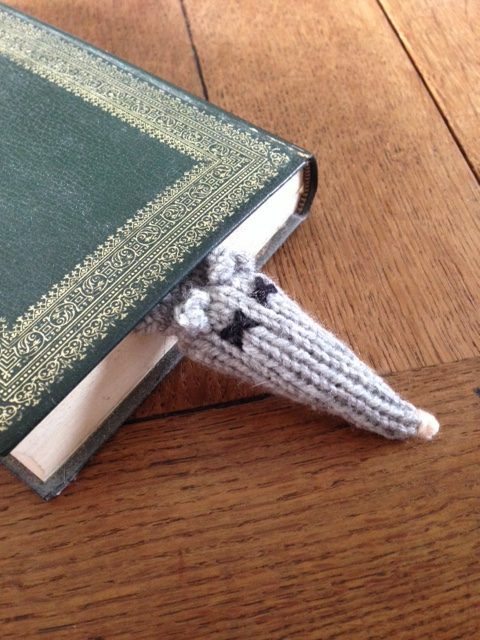 Whether you love the little critters or not (I imagine it all depends on if we’re talking about the pet or wild variety) I think we can all agree that squishing them inside books equals fun. I can’t claim the original idea as my own unfortunately, nor can I remember where I first saw it but today’s pattern is all my own creation. 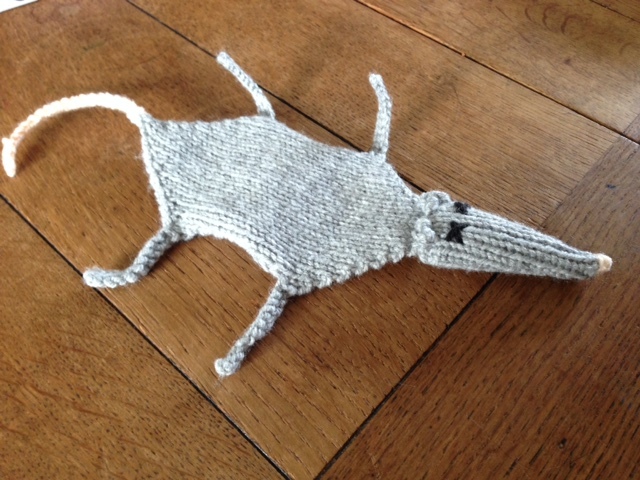 So if you fancy squishing rats inside your favourite reading materials then give my Squashed Rat Bookmark Knitting Pattern a go! Using 3mm needles cast on 2 stitches in grey/brown. 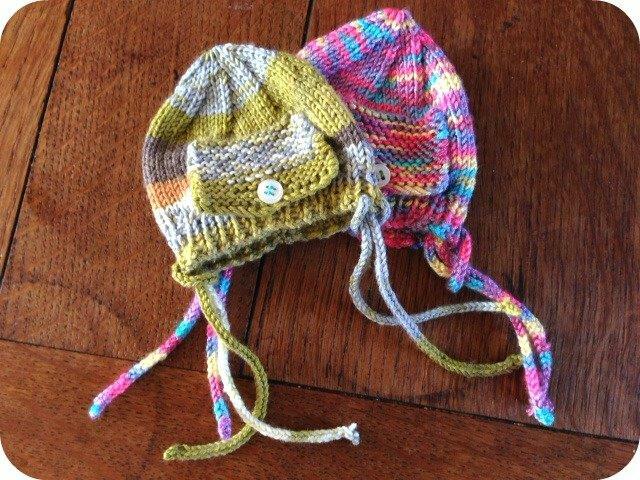 Bring the two sides of the head together and stitch leaving the back open, lightly stuff before closing. Stich on eyes using black wool and making cross shapes. 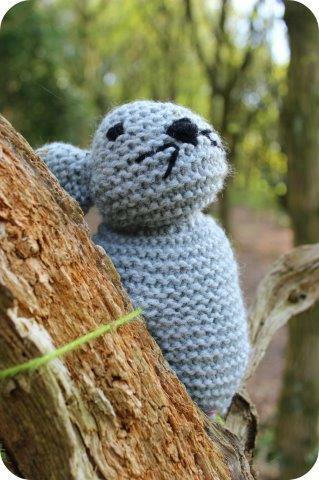 The ears are made by stitching a large stitch in grey on the top of the head and then blanket stitching around this stitch about 5 times. 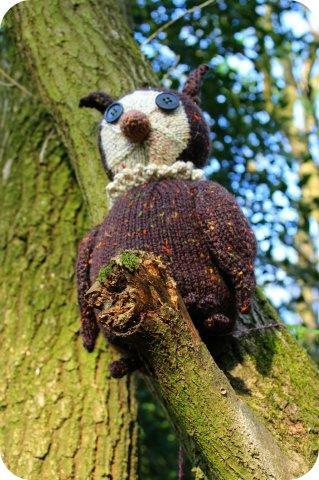 Every year a magical event takes place as part of Voluntary Arts Week – The Woollen Woods. 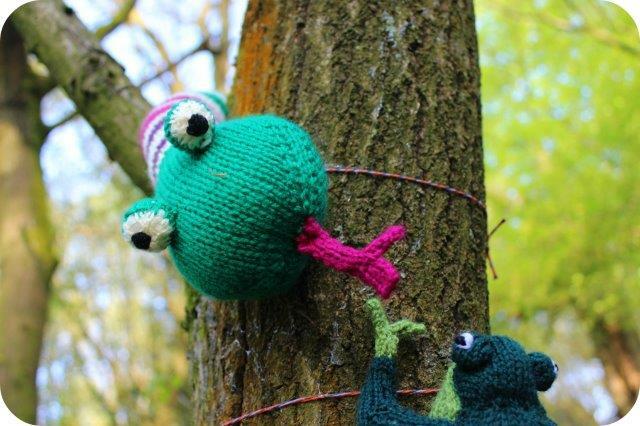 Woodlands across the country become inhabited with all manner of knitted (or crocheted) creatures to the delight of thousands of visitors. It all started last year with seven woods (of which Derbyshire was one) and this year it grew even bigger. This was the second year I’d had the pleasure of joining in with the Derbyshire Woollen Woods held in Belper Parks Wood. It was such a huge success that I felt compelled to share a few pics (and videos) for those who couldn’t manage to make it along. 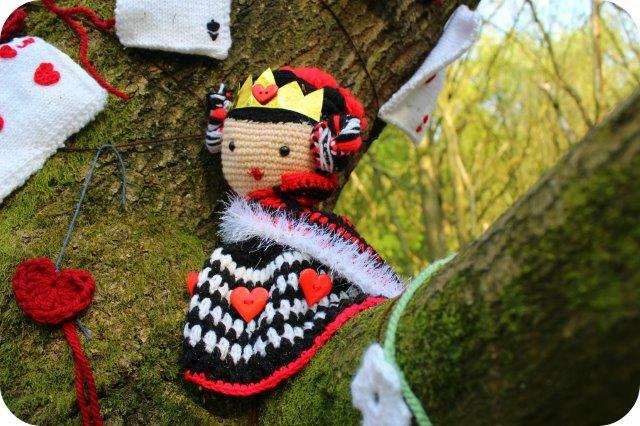 It took months of hard work by local crafters (and a few further afield) to make enough pieces to decorate the majority of Belper Woods but as you can hopefully see from these pics it was definitely worth it. The creations were displayed between 7-15th May this year and the response we received was absolutely wonderful. We even had some visitors travel quite a distance for a day out in our Woolly Wonderland! I believe there’s a special childlike joy that only magical woolly creatures can bring and with that in mind here’s a few of my favourite pieces (not made by me) and two mini video tours. If looking through this post has got you itching to get involved with the Derbyshire event then pop over to >Anne Clark Handmade and send Anne an email. 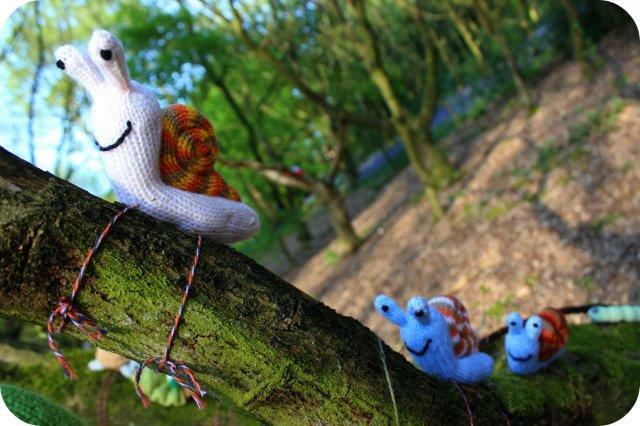 Anne organised the Derbyshire Woollen Woods for both years and we’ve also yarn bombed several other events including local festivals, Christmas decorations, the hospital, museum and much more! 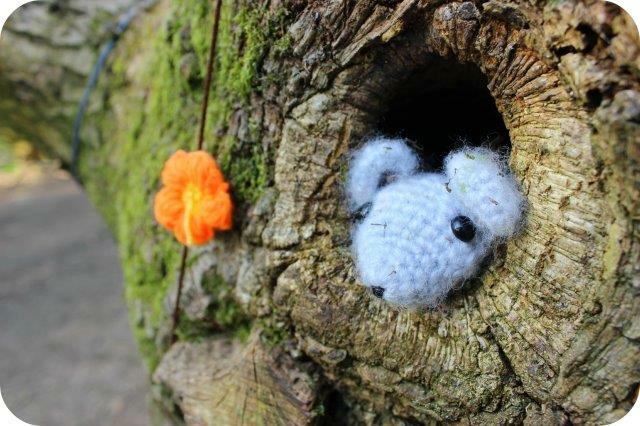 If you weren’t lucky enough to be able to visit a Woollen Woods this year then keep your eyes peeled on the >Voluntary Arts Week website for details of the event next year. 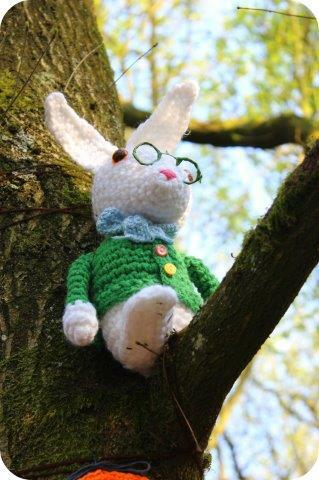 To see some pics of last years Woollen Woods check out my 2015 post.